PROMOTIONAL PRICE - LIMITED TIME ONLY! Do you want take pride in Hombrewing? 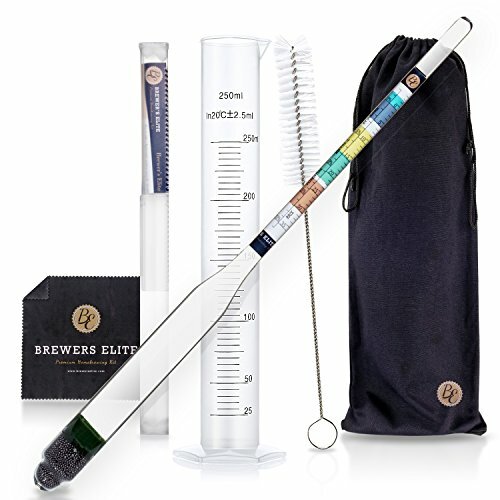 Then you need the Brewer's Elite Ultimate Alcohol Hydrometer & Test Jar Combo Set! Here at Brewers Elite, it is our mission to make the world's best Hombrew equipment, so that you can focus on making the world's best brews! This Ultimate Set is the only kit to come with a FREE microfiber cleaning cloth so you can clean up your set in style, and a 250ml Graduated Cylinder, a handy bag, and a cleaning brush, so you have everything you need to start taking reading's straight away! ★ EASY TO READ - Easy use colour scale gives you a visual guide of when your brew is ready. Our font has also been specially designed for crystal clear reading. ★ TEST JAR COMBO - Our 250ml Test Jar is graduated with numbers on the side for easy reading. With this combo you have everything you need to get started. ★ EXTRA STRONG PROTECTIVE HARD CASE - will keep your hydrometer safe for years to come. ★ BEAUTIFUL MICROFIBER CLEANING CLOTH. - The only set to include a high quality cleaning cloth. ★ ALL IN ONE - This beer hydrometer easily measures specific gravity, potential alcohol and brix. ★ INSTRUCTION MANUAL - and handy conversion table to easily swap units and adjust for temperature correction. When you buy this kit you will receive a Brewer's Elite 100% Money-Back Guarantee! We are so certain that this Premium Triple Scale Hydrometer Kit will satisfy you that we offer a 90 day no-questions-asked refund policy! ★ Brewer's Elite Triple Scale Hydrometer & 250ml Test Jar - Combo Set - WITH Super tough Hardcase, Cleaning cloth, Bag & Brush. ★ This specific gravity hydrometer allows you to easily calculate Alcohol % (ABV) - Graduated color bands help you know when you brew is ready, and our Crystal clear fonts are so easy to read. ★ Create the perfect brew - with this durable all glass brewing hydrometer make great beers, wines, cider and Kombucha at home - The perfect tool to test when your sample liquid has finished the fermentation process. ★ Triplescale wine hydrometer - Specific Gravity (0.99 - 1.16), Potential Alcohol (0%-20%), Brix Balling (0-35) - Check alcohol density with ease! ★ 100% Money back guarantee - if you are not COMPLETELY satisfied we will give you your money back. If you have any questions about this product by Brewer's Elite, contact us by completing and submitting the form below. If you are looking for a specif part number, please include it with your message.